Tomorrow's metropolis: Virtualization takes command (P. Droege, Urban Design Program, Faculty of Architecture, University of Sydney). The new centrality: The impact of telematics and globalization (S. Sassen, Graduate School of Architecture, Planning and Preservation, Columbia University, New York). Glossy globalization: Unpacking a loaded discourse (P. Marcuse, Division of Urban Planning, School of Architecture, Planning and Preservation, Columbia University, New York). IT 2000: Singapore's vision of an intelligent island (C. Wei Choo, Faculty of Library and Information Science, University of Toronto, Ontario). Korea's development strategy for information and telecommunications in the 21st century (S. Yang, Korea Electronics and Telecommunications Research Institute (ETRI), Taedog Science Town, Taejeon). New information technologies for Australia (M. Cavill, ConsulPan, Strategic Telecommunication Research, Urban and Regional Development, Melbourne). Knowledge-based manufacturing and regional change: A case study of the scientific and medical equipment industry in Australia (A. Garnsworthy, K. O'Connor, Department of Geography and Environmental Science, Monash University, Melbourne). Telecommunications policy for regional development: Empirical evidence in Europe (R. Capello, Dipartimento di Economia e Produzione, Politecnico di Milano, Milan; and P. Nijkamp, Department of Regional Economics, Free University, Amsterdam). Telecommunications and economic growth: the direction of causality (D. Lamberton, Urban Research Program, Australian National University, Canberra). Marketspace: the new locus of value creation (J.F. Rayport, J.J. Sviolka, Harvard Business School, Cambridge, Massachusetts). Reinventing democracy (W. Dutton, Communication and Public Administration, University of Southern California). Telework: An intelligent managerial initiative (J. Wood, Graduate School of Business, University of Sydney). Telecommunications and the urban environment: Electronic and physical links (S. Marvin, Department of Town and Country Planning, University of Newcastle-Upon-Tyne). Telematics and transport policy: Making the connection (S. Potter, Energy and Environment Research Unit, The Open University, Milton Keynes). Open service platforms for the information society (R. Popescu-Zeletin, Research Institute for Open Communication Systems, Fokus German National Center for Information Technology (GMD), Berlin; T. Magedanz, Department for Open Communication Systems, Technical University, Berlin). Environmental information for intelligent decisions (T. Kaye, S. Noble, Client and Program Services Section, Environment Resources Information Network (ERIN), Canberra; W. Slater, Environment Resources Information Network, (ERIN), Canberra). Intelligence about our environment (H. Bruhns, Centre for Configurational Studies, Design Discipline, Faculty of Technology, The Open University, Milton Keynes). Cities as movement economies (B. Hillier, The Bartlett Graduate School, University College, London). Electronics, dense urban populations and community (P. King, S. Miranda, King-Miranda Associati, Milan). Paradoxes and parables of intelligent environments (A. Bowen-James, Faculty of Design, Architecture and Building, University of Technology, Sydney). Cognitive cities: Intelligence, environment and space (M. Novak, Advanced Design Research Program, School of Architecture, University of Texas at Austin). The art of virtual reality (M. Heim, Virtual Reality Specialist, Los Angeles). Hybrid architectures and the paradox of unfolding (P. Lunenfeld, Graduate College, Art Center College Design, Los Angeles). Structuring virtual urban space: Arborescent schemas (M. Ostwald, Department of Architecture, University of Newcastle, Australia). The declining significance of traditional borders (and the appearance of new borders) in an age of high technology (G.T. Marx, Department of Sociology, University of Colorado at Boulder, Colorado). 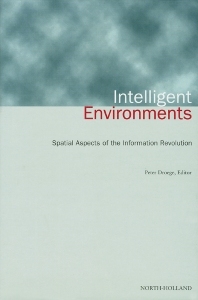 Language, space and information (R. Coyne, Department of Architecture, University of Edinburgh). Labyrinths of the mind and the city: Both real and virtual (M.C. Boyer, School of Architecture, Princeton University, New Jersey). Architecture versus the new media (M. Pawley, World Architecture, London). Recombinant architecture (W.J. Mitchell, School of Architecture and Planning, Massachusetts Institute of Technology, Cambridge ,Massachusetts). Immutable infrastructure or dynamic architectures? (A. Godfrey, Cambridge, Massachusetts). Intelligent building enclosure as energy and information mediator (A. Mahdavi, Center for Building Performance and Diagnostics, Department of Architecture, Carnegie Mellon University, Pittsburgh; K. Poh Lam, School of Architecture, National University of Singapore). Computer city (K. Sakamura, Department of Information Science, Faculty of Science, University of Tokyo). Interactive strategies in virtual architecture and art (W. Strauss, W. Fleischmann, C.A. Bohn, Department of Visualization and Media Systems Design, German National Center for Computer Science (GMD), Sankt Augustin, Germany). Hybrid architectures: Media/information environments (B. Seaman, Department of Visual Arts, University of Maryland, Baltimore). IntelliText: An environment for electronic manuscripts (B. Jansen, Division of Information Technology, Commonwealth Scientific and Industrial Research Organization (CSIRO), Macquarie University, Sydney; D. Ferrer, CNRS, Institut des Textes et Manuscrits Modernes, Paris). The uncanny home: Or living online with others (S. McQuire, Art and Architecture, School of Social Inquiry, Deakin University, Geelong, Australia).